I can’t believe in just two days August will be here!!! Is it just me or did July go by way too fast? Can’t summer just slow down a bit?!? For the last two weeks we’ve had nothing but cooler temperatures, I hope that’s not a sign of things to come 🙁 It’s too soon for fall like temps!!! I have a love/hate relationship with white denim. To me, white denim goes hand in hand with summer. You can pair them up with just about anything. From nautical stripes to prints, florals, bright colours and even dark colours…white denim will always look good. I mean, how can you not love that. Right?!? Wrong! If you’re like me then the fear of keeping them clean is always in the back of your mind. Lets face it, you become an instant dirt magnet the minute you put them on! And washing white denim? Ugh, now that can be a challenge. Thank goodness for Oxi Clean! It’s my secret weapon 🙂 It’s the only thing that keeps them bright. Oh the joys of white denim!!! Are you guys having nice weather? Don't worry it will get warm again! I love those jeans, white pants are always so great. Love this outfit, you look seriously amazing! I totally agree with you about white jeans. I am always so scared to wear them in case I get them dirty! Love this look Jackie! I saw it on Instagram and thought it was such a great look for summer. I have a difficult time keeping my whites stain-free and oxi-clean is a favorite of mine as well! My main complaint with whites is how quickly they begin turning gray - if only we could figure out a solution for that! 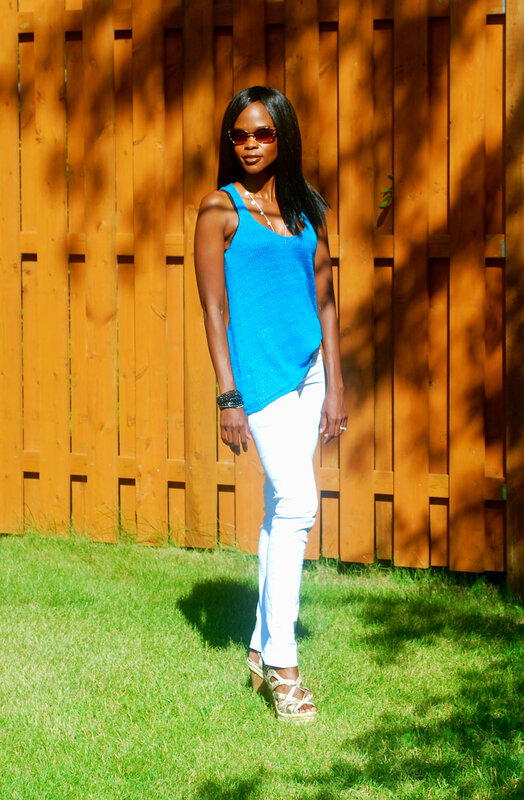 Even with the cooler temperatures you are still dressing so wonderfully for summer! Love the blue and that crisp white together! Yes summer is going by way too fast! I also have love hate with white denim. But girl you rock it!! The weather is hot in Greece right now :) I love wearing white denim ... my favorite is a skinny pair by JBrand. Not everyone can pull off white denim!! You sure can! Would love to have your legs! Met Gala Part 2 : Likes, Dislikes, and the In-betweens!